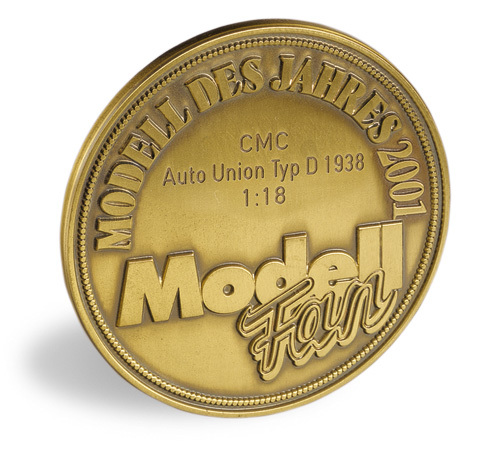 CMC’s miniature replica of the Auto Union Type D is a metal precision model that is hand-assembled from more than 800 single parts. As one of our masterpieces, it became a highly-demanded collector’s item upon its first release. 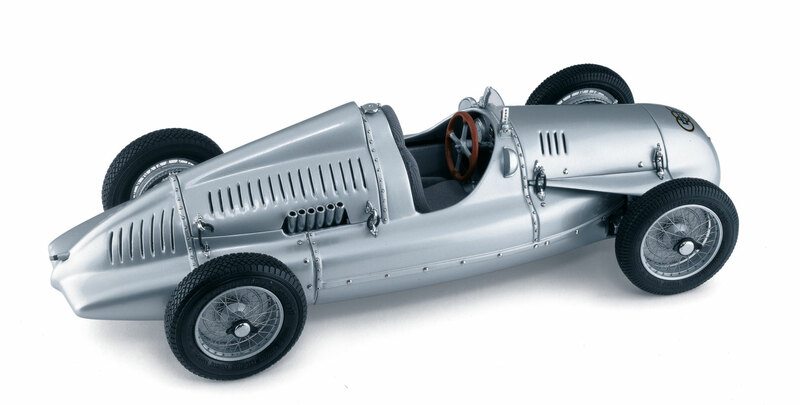 Note that the premium finish of bodywork in CMC’s model is a perfect fit for the soft, curvy lines of the Auto Type D. There is good reason that the Auto Union Type D is known as one of the most beautiful race cars ever. In early 1938, the racing department of the Auto Union was faced with virtually insurmountable problems. Their engineering chief, Ferdinand Porsche had left the company, and their top race driver, the European Champion Bernd Rosemeyer had died in a tragic accident. Auto Union was trying its best to fill the void, a task that was seemingly impossible to fulfill. But they managed to develop a new race car that could match its Mercedes-Benz counterpart. Luck was on the side of the Auto Union this time. They hired the highly-respected Robert Eberan von Eberhorst as their new engineering chief. In view of the changed rules of Grand Prix, Eberhorst designed a completely new 3-litre 12-cylinder compressor engine for the 1938 season. The chassis was also re-designed and received the designation Type D. Furthermore, the Auto Union managed to sign up the world-famous race driver Tazio Nuvolari. From the onset, the newly-formed Auto Union team proved to live up to high expectations. The husky Type D won the GP´s of Italy and England in 1938. The success story continued at the GP of France in 1939. On July 9, Auto Union accomplished a dual victory, with H.P. Müller finishing first, and his teammate Georg “Schorsch” Meier winning a highly acclaimed second place. On September 3 of the same year, Auto Union celebrated another triumph in Belgrade. Nuvolari drove his Auto Union Type D to clinch the last Grand Prix championship before World War II, the subsequent outbreak of which stopped the GP racing for many years. Awarded by: Magazine "Modell Fan"